Cardiff is the capital city as well as the commercial, cultural and economic hub of Wales. With a population of over 346,000, Cardiff has been undergoing a continuous and sprawling regeneration since the 1980’s. Enjoying the lion’s share of Wales’ public and private investment interest, Cardiff is a city with a promising economic future. Like many major UK cities, Cardiff’s population, economy and commercial and residential property grew off the back of the coal industry and the development city’s port, which opened in the 1800’s. Growth spiked in the 1830’s with Cardiff playing a central role in exporting coal to England, either via canals to Bristol or via the railway which was connected directly to the dock. Cardiff was granted city status in 1905 and became the biggest exporter of coal, topping 13 million tonnes by 1913. By 1939 Cardiff Docks was the biggest coal exporting port in the United Kingdom. They become a major target for enemy bombers throughout the Second World War, damaging hundreds of houses and business premises in the process. The end of the war saw significant change. The docks continued their pre-war decline and in 1946 coal exports barely reached a million tons. By 1964 coal production ceased and coal had to be imported into Cardiff. Today, Cardiff is a city built on finance, retail and media and together with tourism, make it the economic powerhouse of Wales, playing a vital role in creating jobs for city and the wider city region. Derelict docklands have been transformed over the last 30 years. Historic architecture, such as the Pierhead Building (reopened in May 2001 as 'The Assembly at the Pierhead'), Norwegian Church and Craft in the Bay (‘D Shed’ building) now sit alongside more modern developments. These the Wales Millennium Centre, the Senedd (the National Assembly for Wales) amongst others such as Roald Dahl Plass and Mermaid Quay, an area containing various retail and leisure outlets including restaurants, bars, shops and hotels. 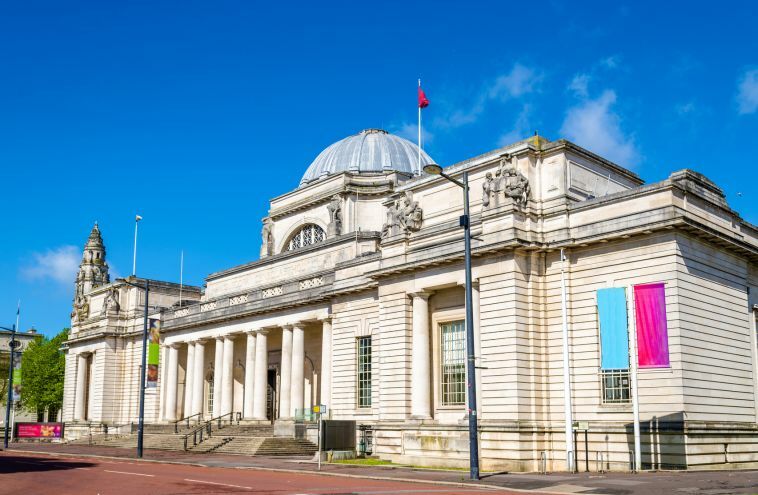 The city is home to four major institutions of higher education: Cardiff University, Cardiff Metropolitan University, University of South Wales and the Royal Welsh College of Music & Drama. Cardiff is also the Welsh hub for media and entertainment with BBC Cymru Wales, ITV Wales, and S4C all based in the city. Popular television shows like Dr. Who and Sherlock are filmed in Cardiff. 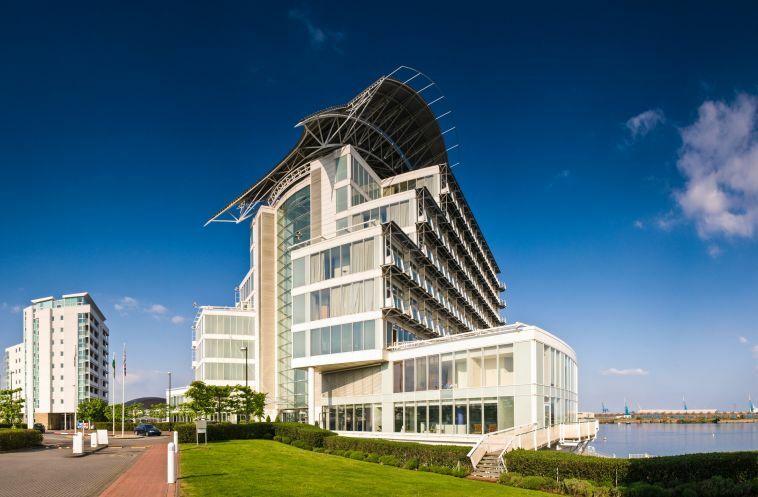 Notable company’s taking office space in Cardiff include Molson Coors, Coco Cola, Lloyds Banking Group, GE Aviation, Iceland Foods and Admiral Group amongst others. Cardiff’s economy has grown at a steady rate of 4.7% over the past 5 years. Forecasters predict that this could increase to 10.1% by 2022, surpassing the 9.5% average the UK is currently seeing 1 . With high levels of economic growth, unemployment is forecast to fall, resulting in a 3.8% growth in office based employment. Much of this is predicted to occur within the technology industry, which itself is expected to grow by 7% in the next five years. Another factor expected to prompt economic growth in Cardiff is the electrification of the South West Mainline, set for completion in 2018. It will reduce travel time to London by 15 minutes and bring an increased number of commuters to the city. According to the Office for National Statistics, Cardiff’s current population is 357,200, having seen an 11% growth in population between 2005 and 2015. This was the third largest increase in the UK, with only Manchester and Nottingham surpassing Cardiff. It is projected that the population of Cardiff will grow by around 72,000 by 2035, representing a 20% growth rate, which will make Cardiff the UK’s fastest growing city. Following a strong 2016 H2, Cardiff’s commercial property market is enjoying a period of high demand and positive expectations for 2017 and onwards. From 2015 to 2016, commercial property take-up in Cardiff grew by 9% and was 39% higher than the five-year average 2. In 2016, 71% of office space take-up was in Cardiff city centre. Of that 57% was Grade A 3 .
Notable deals include; Hugh James taking 100,000 sq ft at 2 Central Square, MotoNovo taking 71,000 sq ft at 1 Central Square and HMRC taking 54,587 sq ft at Brunel House. 23% of take-up was by Public Services, Education and Health – the most active business sector during 2016, closely followed by Professional Services at 22% 4 . Because demand for Cardiff office space is so high, supply continues to fall, pushing demand further. In 2016, Grade A supply fell by 34% 3 . At current take-up rates market supply has fallen by 5%, to 1.2m sq ft, a trend expected to continue through to the end of 2017. This is despite the fact that a number of new developments are underway, including 2 Central Square, Fusion Point 3, 3 Capital Quarter and the new BBC headquarters, all to be completed by the end of 2017. Headline office space rents in Cardiff increased from £22 per sq ft in 2015, to £25 per sq ft in 2016 and should continue to rise throughout 2017 going into 2018. This has encouraged developers to acquire prime sites and is also putting pressure on the market for more Grade A developments 4 . Out of town rents remain static at an average of £14 per sq ft 3 . Vacancy rates for retail floor space have declined in the Welsh capital over the past year, from 4.9% in 2015 to 3.2% in 2016. Since the economic downturn of 2008, the retail market is finally on the rise. An increase in luxury brands has bought names such as Michael Kors, Victoria’s Secret, Zara Home, Nespresso, Anthropologie and Urban Decay to Cardiff. One reason for Cardiff’s retail upturn in the opening of the St David’s shopping centre which houses over 180 stores, with an average unit size of 5,200 sq ft. Following a slow start to 2017, take-up of Cardiff industrial property increased slightly compared to the same period in 2016. Availability of industrial space in Cardiff has now reached its lowest level in six years. Although Brexit has not affected overall demand, it is noteworthy that a few large manufacturing companies have delayed expansion plans. Headline rents have remained consistent since 2016 but are expected to rise as supply drops. It is units with secure yards that are, and will continue to be, in the highest demand and thus will command a premium. The volume of co-working space and shared office space in Cardiff has grown rapidly over recent years. This is thanks largely to the fact that Cardiff has enjoyed much attention by private and public investors. With the economy growing growing, more start-ups are looking for affordable and flexible working environments in Cardiff. Cardiff is home to Cardiff Airport, Wales’ only international airport. In 2016, passenger numbers increased to 1.3 million. This trend of growth is expected to continue. The airport is situated 12 miles outside of Cardiff centre and there are regular bus and rail services connecting the two. In April 2017, Qatar Airways announced that they will start operating regular services from Cardiff to the major global markets in the Middle East via Qatar’s capital city, Doha. Central Cardiff Railway Station is the largest railway station in Wales, processing over 10 million passengers each year across seven platforms. Cardiff is also home to Wales’ second largest station, Cardiff Queen Street, running routes that connect the city with the rest of country. Cardiff city is serviced by a comprehensive and reliable bus timetable. Busses also connect the city with the nearby airport, as well as the immediate surrounding area, including Barry and Newport. National Express and MegaBus complete the task of connecting Cardiff with the rest of the UK, including London, Newcastle, and Manchester. Cardiff’s population is on the rise. In 2011, according to the most recent census, the population stood at 346,100, compared to 305,353 in 2001. However, the Welsh Government's official 2016 mid-year estimate put the number at 361,468. 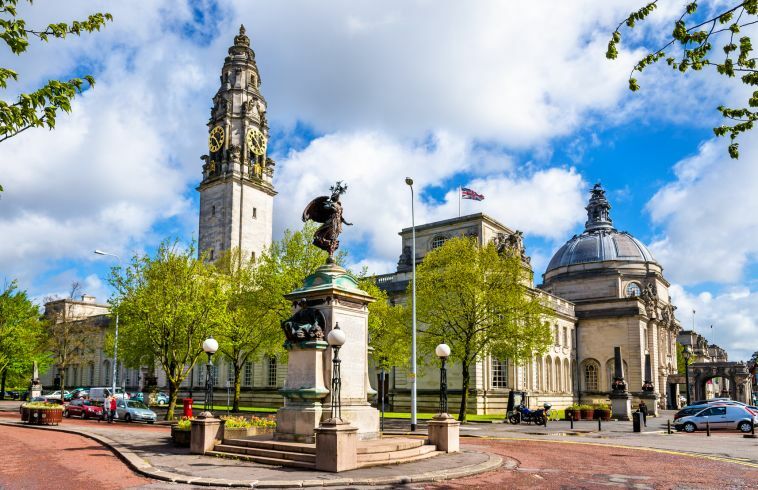 Thanks to the city’s historical trading connections, Cardiff has an ethnically diverse population made up of immigrants from around the world, as well as thousands of international students. According to a 2005 report, ethnic minorities made up 8.4% of the city's total population; most notable are the city's long-established African and Arab communities, many of whom live in the Cardiff’s Butetown district. English is, by far, the most prevalent language in Cardiff, but the number of Welsh speaking residents is experiencing a year-on-year rise. It is estimated that 11% of the city’s population are now Welsh speakers. Although not widely spoken, Cardiff’s population is thought to speak upwards of 94 different languages, including Somali, Urdu, Bengali, and Arabic as some of the more prevalent. When it comes to religious beliefs, a clear majority of Cardiffians label themselves as Christian. However, the city enjoys a large Muslim community making up around 3.7% of the total population. This is well above the UK average of 2.7%. Cardiff is an influential hub for rock music. Well known acts that hail from the city include Manic Street Preachers, Super Furry Animals, Stereophonics and Feeder. The city is also home to the world’s oldest record shop, Spillers Records which opened in 1894. A study by the Performing Rights Society revealed that Cardiff is the second most musical city in the UK based upon the number of bands having their origins in each UK city. The city also has a number of highly regarded music venues including Cardiff International Arena, St. David’s Hall, Wales Millennium Centre and Cardiff City Stadium. In 2014, the city was awarded the title of European Capital of Sport. Despite a rich sporting heritage, it was the construction of Millennium Stadium that really put Cardiff on the map of international sport. Initially built to host the 1999 Rugby World Cup, the stadium is now the home of the Welsh International Rugby Union team as well as cluster of other major sporting events, including The London Olympics of 2012, the Tsunami Relief Concert and international test cricket. The city is also home to Cardiff City Football Club, who play at Cardiff City Stadium and are the only Welsh team to compete in the Championship, the second tier of the English Football League. The average price for a home in Cardiff stood at £236,529 in September 2017, representing a 2.56% rise in 12 months 5 . Other sources claim that this rise could be as high as 5.88%. As with the rest of the UK, property sales are dropping in Cardiff. In June 2017, there were 25% less flat sales than the same month a year before and a 21% drop in detached property sales. However, the same time period saw an 11% increase in terraced property sales. In September 2017, overall rent values in Cardiff were 1.3% higher than the year before.6 The average rent value now ranges between £600pcm for a 1 bed property to £950pcm for a three-bed property 7 .